Lt. Gen. Alan Lynn took over as director of the Defense Information Systems Agency in July 2015, assuming leadership of the agency after previously serving as vice director and as chief of staff. He's also spent time leading Army Network Enterprise Technology Command and Army Signal Center of Excellence, priming him to lead the Defense Department's mission-critical IT agency. 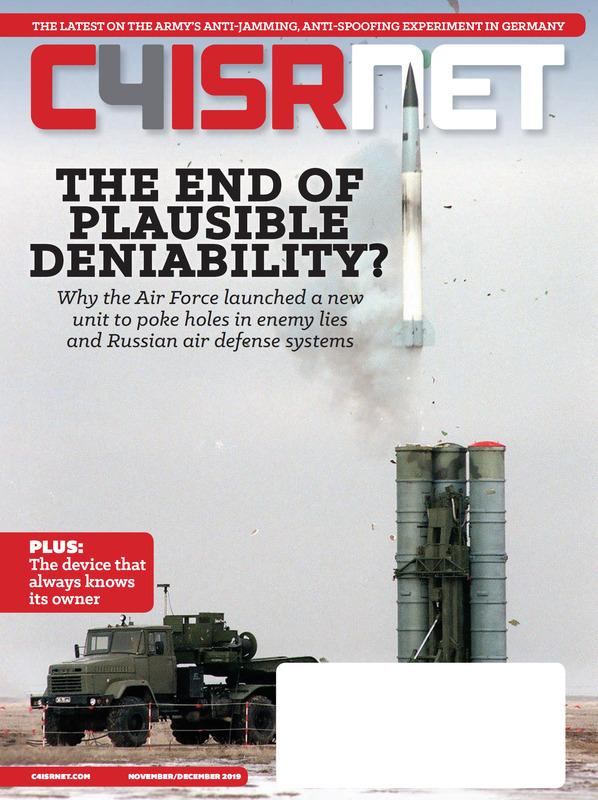 recent interview with C4ISRNET, Lynn talked DISA priorities, progress and challenges, and what's in the pipeline for the agency. You're nearly two years into your tenure as DISA director. What would you say have been some of your biggest achievements so far? What have been some challenges? What have you learned? The biggest challenge is staying ahead of our adversaries in the cyber domain. The battle is constant and ever-changing. It's not episodic; we face a constant pounding of attacks looking for seams in our architecture. We continually balance capability with security. We are always evolving the nature of the network to keep our edge. I've learned so much from this experience. The smart people that make up DISA and Joint Force Headquarters–Department of Defense Information Networks, or JFHQ-DoDIN, are constantly teaching me what it means to be a leader in this information age. They are full of insightful, innovative ideas and dedicated to taking care of the war fighter and the nation by defending the network and operating in the cyber domain. What's at the top of your to-do list? Assured identity and software-defined networking remain at the top of my list. They are game changers. We are making great progress, but both topics are complex. While we are building the solutions in those areas, we need the big changes in the policies for acquisition and implementation to keep pace with needed advancements. We are also busy getting the Joint Service Provider and JFHQ-DoDIN to full operational capability. Expanding the classified mobility capability at the secret level and top-secret level is also a critical priority. One of your priorities is people. How are you investing in people at DISA, and how does that priority fit into the broader DISA picture? We need the best and brightest in the IT and communications field to be on our team. That means we have to be innovative in recruiting, training and retaining the IT and cyber workforce of the future. There is a special hiring authority for the cyber workforce that helps with the recruitment. We are hiring at every level, but I'm especially proud of the cyber intern program because we are recruiting great people who are so bright and innovative in their thinking. We also have a terrific competitive education program that keeps our current workforce at the top of their game. Last year, resilient networks and assured identity on wireless networks were initiatives you discussed. Where do those initiatives stand now? coalition partners on the DoDIN. That's a great advance in making our networks resilient and gives us the ability to build a special purpose network on demand. We continue to refine the concept and develop the policies that govern its use so that the mission partners are able to build in their cybersecurity to operate such a network. U.S. European Command and U.S. Africa Command are spearheading the use of these environments. The great partnership we have with these combatant commands is critical to developing and evolving that capability, and I appreciate the senior leaders of EUCOM and AFRICOM being willing to step out there to work with us to make this a reality. We are working with the Defense Advanced Research Projects Agency and industry on assured identity. Multifactor authentication is the way to go and it's coming together. We also have figured out the soft credential issue for unclassified mobility, and that's been a huge step forward in putting CAC cards behind us. Just before he stepped down, DoD CIO Terry Halvorsen said Windows 10 would be one of his successor's biggest projects. That's likely something DISA will be very involved in, correct? What's the strategy for Windows 10? DISA worked with DoD CIO, the National Security Agency, and the Air Force to deliver the standard DoD image for Windows 10 for the Department of Defense, known as the secure host baseline. That was our main effort initially and it set up the capability for all of DoD to have the information they needed to migrate. Then our goal was to migrate ourselves and set the standard in DoD. It's a huge undertaking to transition that much information. Just for DISA, we migrated 15,881 workstations, on both the non-secure internet protocol router network and secret internet protocol router network, at 40 different locations. We had a team of people operating 24 hours a day, seven days a week for 25 days to get it done. What are some of the other big-ticket items — major projects, contracts, initiatives — are on tap for DISA? How are you tackling those? We are very close to completing source selection for MilCloud 2.0, which will provide an on-premise, commercial cloud capability for information up to and including secret to satisfy the requirements of our mission partners. We are also well along in the process for the next generation email and office productivity suite of tools that we call Defense Enterprise Office Solutions. It will be a commercial, cloud-based software-as-a-service capability that will include email, chat, and enhanced collaboration tools including multiplatform collaboration tools that include mobility options. We are on track for a planned contract award in this fiscal year. Later this year two contracting vehicles will be awarded - Encore III and Systems Engineering, Technology and Innovation (SETI). Encore III, which is worth an estimated $17.5 billion over 10 years, will be a multiple-award, indefinite delivery/indefinite quality contract for a diverse, evolving, mission-critical and technically sophisticated set of IT capabilities. SETI, a new acquisition tool, will provide an overarching approach for fulfilling requirements for developmental IT and engineering support services across the department. It is worth an estimated $7.5 billion over 10 years. How do you see your work at DISA impacting troops on the ground? There are so many areas where the capabilities we provide have a dramatic impact on the ability of troops on the ground to do their mission. The kind of information that runs on our networks includes the unmanned aerial vehicle strike and reconnaissance capabilities, the network required for ballistic missile defense, and both classified and unclassified mobile capabilities. We are the classified mobility solution for the Department of Defense and many of our mission partners across the federal government. We enable war fighters in all branches with the mobile capabilities they need to do their mission in any environment. We get them the information they need, the applications they need and the connectivity they need to be fully mobile. We get the joint war fighters and the civilians who support them worldwide out from behind their desks and their CPUs or laptops, and get them out into the world to work and collaborate to get the mission done. The communications we provide troops on the ground saves lives. Troops are surviving at a much higher rate because a wounded service member can be located, extracted and delivered to emergency medical treatment within the "golden hour" when trauma care is most important. We supply the immediate and always-ready communications and network infrastructure that makes that possible. In addition to what I've already mentioned, I believe the next most exciting development is moving to the Grey Net. The Grey Net is software-defined and mobile down to a single device. It gives us the ability to encrypt and decrypt data at the endpoints. We can get away from device-dependent, hardware-heavy networks with multiple firewalls and boundaries, where classified data must remain on a separate network. We are open to all kinds of innovation and we want to work with our industry partners to understand their innovative ideas in cybersecurity, network operations and development, mobility and supporting applications, and transport. The more we know about what our industry partners are developing, the better able we are to select technologies to adapt to support the warfighter. That close relationship with our mission partners is vital to maintaining our advantage in the cyber war-fighting domain and building better, more survivable modern IT infrastructure.